There are camera bags, there are backpacks. One is for photographers in an urban word while the other is for trekkers who need comfy shoulder straps and some waterproofing. So who is that takes all of those great nature shots? Booq obviously knows, and it’s for landscape and wildlife photographers that its novel Booq Python Pack has been created for. This isn’t a niche bag; hasn’t every D-SLR owners wanted to trek with their beloved camera but been put-off because of a shoddy bag? The Booq Python Pack is nothing if not comprehensive; inside are nicely padded – in bright red felt-like material – compartments for up to two cameras and four lenses. There’s a tripod clip on the front, too, as well as room for a couple of smartphones in pouches on the comfortable shoulder straps. Another pocket on the sides is home to a bright red shower cover for downpours out on the mountains – something no D-SLR bag has featured to date, as far as we know. Between the shoulder straps on the back-facing section is a quite wonderful pocket that’s perfectly sized to take an iPad. The Apple goodness doesn’t stop there; nearby is a section for a laptop, fitting perfectly our 15-inch MacBook Pro. 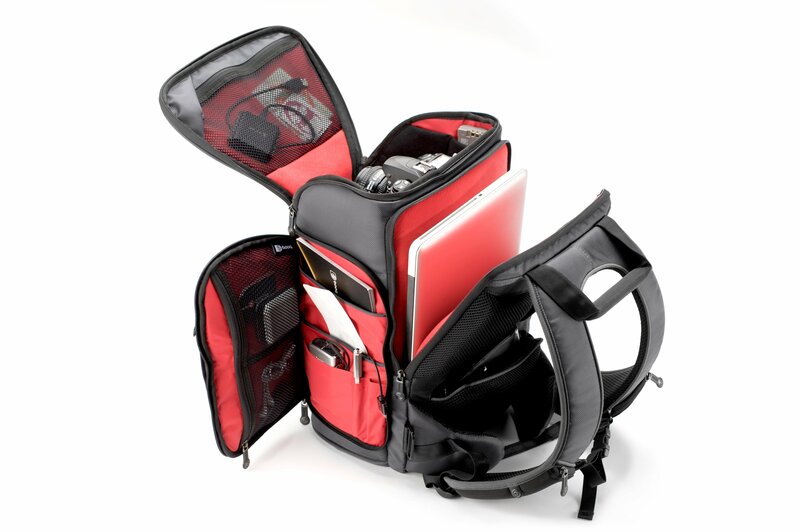 The photography-centric Booq Python Pack is the ultimate bag for photographers in outdoor environments. Our only complaint is that the straps for a tripod on the outside of the bag are aligned in an odd way.